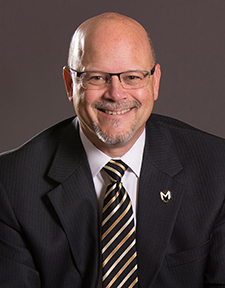 The inauguration of Dave McFadden, Manchester University’s 15th president, will be broadcast live online for those who cannot attend the ceremony in person. 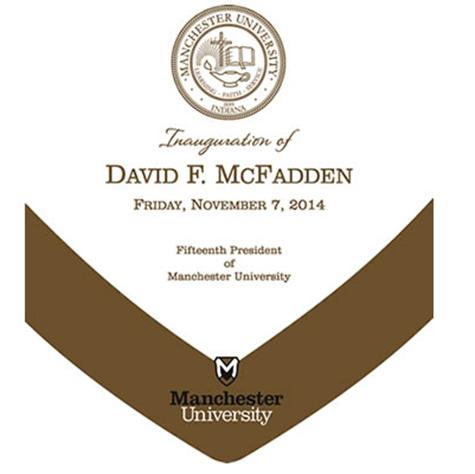 The webcast will be available at https://www.manchester.edu/inauguration/broadcast/index.html beginning about 1:15 p.m. Friday, Nov. 7. The ceremony begins at 1:30 p.m. The title page of the event that appears at the top of this page is a placeholder that will remain until the live event appears. In keeping with honored tradition, the ceremony will open with a processional that includes MU faculty and representatives of other colleges and universities in full academic regalia. Representatives from Manchester University will carry flags representing the United Nations as well as the homelands and study-abroad locations of MU students. The processional will also feature the red-over-white flag of Indonesia, where Dave and Renee McFadden spent many years. During the inauguration, Dave McFadden will receive the Presidential Medallion from Board of Trustees Chair D. Randall Brown. The medallion is supported by a necklace of 24 silver-plated discs. McFadden's name is engraved on one of the discs, along with each of the 14 Manchester University presidents who have preceded him. Former University presidents Jo Young Switzer and Bill Robinson and their spouses will be honored before the presentation of the new president. Manchester graduate Shawn Kirchner was commissioned to compose the inauguration anthem, “Only Now.” Its lyrics are adapted from the novel “Hannah Coulter” by Wendell Berry, one of McFadden’s favorite authors. The anthem reflects the inaugural theme of “abundance” and will be performed by the A Cappella Choir, with Kirchner at the piano and Debra Lynn conducting. Senior Erika Reffitt, a music major from Twelve Mile, Ind., will perform the solo. McFadden will then give the inaugural address. After the recessional at the conclusion of the ceremony there will be a “change ringing” of the University Chime, a sequence of notes dating from 17th century England used to celebrate joyous occasions. The Chime ringer will be Ruth Ritchey Moore of Bryan, Ohio, a sophomore majoring in elementary education.